A stunning upgrade that´s worth every penny. A hugely sophisticated product. V-Vocal is worth the price alone. Improved MIDI functionality. V-Vocal clips can’t be processed offline. Sonar 5 is loaded with new features. Perfect Space is a superior reverb plug-in. A Project5 favourite gets a facelift. Play REX2 files with the RXP player. Fix it in the mix with V-Vocal processing. Unlike many upgrades, the fifth version of Sonar packs some serious power. Cakewalk seem hellbent on giving their users everything they could ever need in one package, and they´ve managed to include some new toys that will have their competitors scrabbling to catch up. Cakewalk´s flagship application, Sonar is a fully featured, professional audio and MIDI environment for Windows that can host VST and DirectX instruments and effects plug-ins. 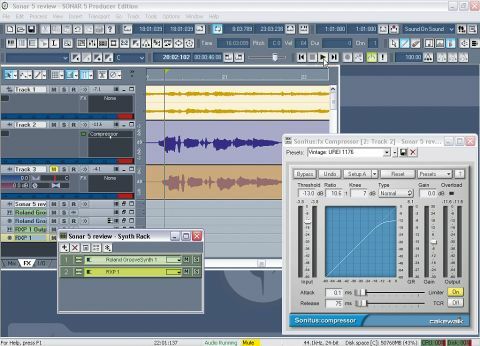 It offers flexible MIDI and audio file editing, surround mixing (in the Producer Edition) and loads of killer instruments and effects right out of the box. Long-time Sonar users will notice a change as soon as they open version 5. This comes in the form of a nag screen informing you that you need to register online if you want to use the software for more than 30 days. It´s a shame that Cakewalk have been forced to adopt a slightly stricter approach to copy protection, but the process is quick and relatively hassle-free. You need only email or call with your serial number to receive the authorisation code. There´s no messing about with machine ID numbers or challenge/response systems, and there are no dongles involved either. You´ll also notice from the outset that it´s no longer necessary to run a separate program in order to use your arsenal of VST instruments and effects. The Cakewalk Adapter application is now fully integrated into Sonar, and it scans for VST plug-ins when you first open Sonar 5. It still looks pretty much the same as before, but it feels more like a built-in part of Sonar now. Was it a necessary change? Not really, but it demonstrates that Cakewalk listen to the complaints and wishes of their users, some of whom have been irked by the fact that they´ve had to use a second program to scan and wrap their VST plug-ins. Sonar´s own compliment of instruments has grown with each new version of the program, so it´s no surprise to find that version 5 comes loaded with a selection of new synths, samplers and more. Project5 users will recognise the PSYN II subtractive synthesizer. This is a fully-featured hybrid synth that offers all the control you could ever want. It also comes with a healthy selection of presets for those moments when you want a quick sonic fix. PSYN II isn´t the only device to migrate over from Project5. Roland´s GrooveSynth has also found a home in the Sonar 5 Synth Rack and comes bursting with sounds from Roland´s legendary beatboxes. The GrooveSynth joins the Roland TTS-1 General MIDI synthesizer, which debuted in Sonar 4. rgc:audio are also responsible for producing the popular SFZ SoundFont player. Although Sonar 5 doesn´t include a fully-fledged sampler, SFZ enables the user to avail themselves of the wealth of free and commercial SoundFonts that can be found online. Sonar has always been ahead of the game when it comes to loop support. It was the first of the major sequencers to offer ACID-style loop handling - in the form of Groove Clips and the stellar Cyclone DXi - and Cakewalk have now added RXP, a REX file player. This simple instrument can play back not just REX2 files, but also SF2 loops. As in previous versions, Sonar 5 includes the astonishingly good Sonitus suite of effects, but that hasn´t stopped Cakewalk from tossing in a couple of new effects, most notably V-Vocal processing. On its most basic level, V-Vocal enables the user to perform Auto-Tune style pitch correction on a monophonic audio recording. You can easily force any recording to a user-defined scale, often without any obvious artefacts. More importantly, though, V-Vocal makes use of Roland´s proprietary VariPhrase technology. VariPhrase devices work by examining and detecting not just the pitch of a given signal, but the timing and formant characteristics as well. Once a file has gone through the detection process, it can be manipulated in a number of ways. Pitch, time and formant traits are treated individually, meaning that you can adjust the pitch of a given note without affecting its timing or timbral qualities. You can use V-Vocal to re-harmonise a vocal, for instance, and create an entirely new melody. You can change a male voice to a child´s voice, or create Beatles-esque multi-part harmonies from a single track. V-Vocal isn´t perfect, and the quality of the results you can get from it depends on the quality of the source material. Also, once you´ve converted an audio clip into a V-Vocal clip, offline processing is no longer available. Still, it's great fun creating a huge chorus from a single vocal line, and the fact that V-Vocal resides inside Sonar makes it a lot more convenient than either Melodyne or V-Synth. V-Vocal alone makes it worth Sonar 4 users paying the upgrade price. There's not enough space to cover every new function in detail, but it's important to mention the improvements that have been made to Sonar´s MIDI functionality. All of the MIDI FX are still here, but they´ve been given a new paint job that´s more in keeping with Cakewalk´s audio plug-ins. It certainly feels like MIDI has been given a lot more attention in general this time around, with clearer, friendlier interfaces and ‘inline MIDI´, which displays MIDI notes and controller information in the track pane. Spend some time with Sonar 5 and you realise that the noteworthy improvements just keep on coming. You can now draw freehand automation curves and perform tempo-sync functions using preset patterns, and the package now sports some keen object-oriented editing functions, including FX bins for individual clips. There´s even 64-bit processing support for those who have the necessary hardware. Sonar 5 brings some serious new professional features to the table. Very few DAWs are this complete. With the number of Sonar users increasing with each version, it's certain that version 5 will claim a lot more new recruits. If you use Sonar 3/4 Producer, this £119 upgrade is pretty much compulsory.